Kyle Smith at bat for Butler. Smith went 1-for-3 in the defeat. Jimmy Lafakis/Collegian file photo. After a tough couple of losses over the weekend to Big East favorite St. John’s, Butler had a chance to bounce back against in-state rival Ball State in Muncie on April 9. Harrison Freed’s five RBIs would not be enough as the Cardinals trounced the visiting Bulldogs, 12-5. Butler got on the board in the third inning via an RBI from Freed, scoring catcher Sam Russo. Ball State answered back, however, with five runs in the bottom of the frame. Butler starting pitcher Joe Graziano would not make it out of that inning. 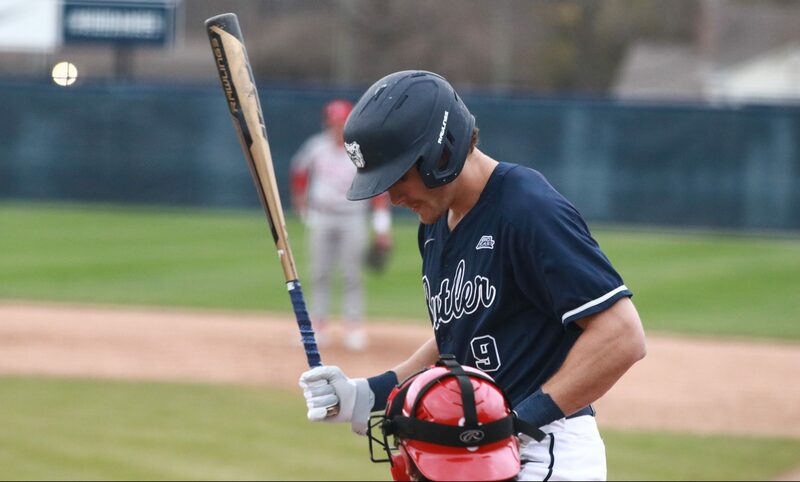 After Ball State added on some insurance runs in the fifth and sixth innings, Freed drove in four runs in the top of the seventh off his two-out grand slam. The grand slam is Freed’s second in three games and the hit raised his team-high RBI total to 45. He had 51 RBIs in his first two full seasons at Butler. The fun would end there for Butler, though, as Ball State would tack on two more runs in both the seventh and eighth innings. Butler would not score another run and head home with a 12-5 loss. Butler falls to 17-13 on the season with their first loss to the Cardinals since 2016. The Bulldogs return home to league play this weekend at Bulldog Park. The Creighton Bluejays come into town for their Big East opening series April 12-14. First pitch is set for 4 p.m. on Friday.